There are 12 WWI CWGC stones within this Churchyard, several WWI and WWII and other family military related graves. 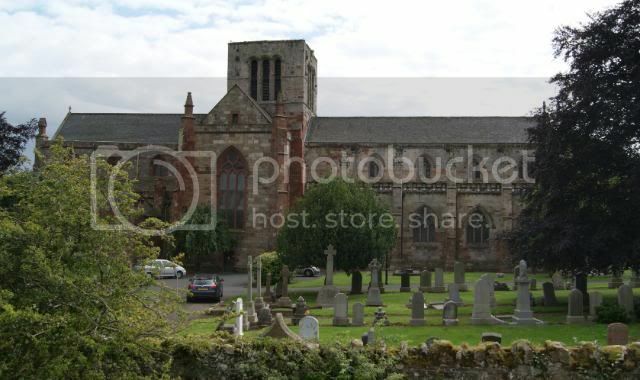 St Marys Church is the largest Parish Church in Scotland. 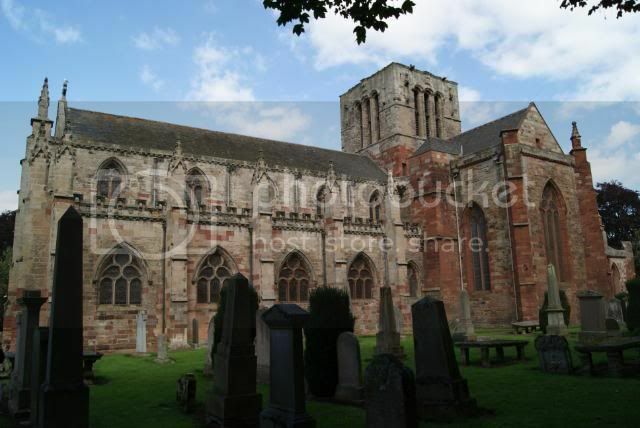 The earliest reference to a church in Haddington dates from 1139. In addition to the parish church there were monastic establishments, all of which suffered at the hands of Edward 111's army in 1355 in a campaign known as "The Burnt Candlemas". The light of the Christian Gospel, however, was not extinguished: within 2 or 3 decades the present fabric was begun, its period of erection extending for half a century or more. The title "Lamp of Lothian", which referred originally to the choir of the Franciscan Friary a few hundred yards down river, has since, passed to the present building, now restored 'for the solace of the whole community'. 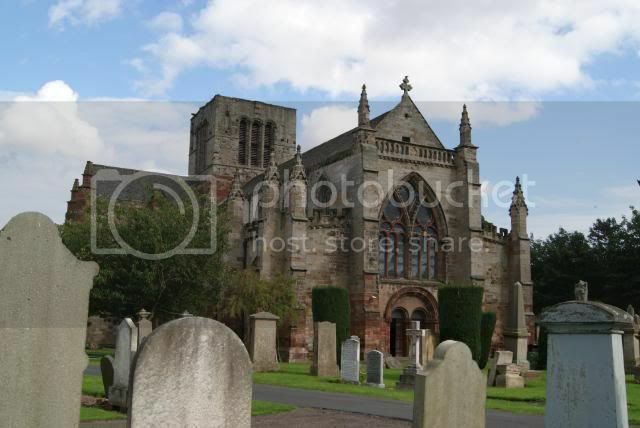 Founded as a Collegiate Church in 1380, and taking over one hundred years to build, the church was largely ruined during the mid ­sixteenth century Siege of Haddington. This was after the Rough Wooing by Henry VIII the siege of Haddington taking place in 1548-49. At the instigation of John Knox, born in Giffordgate just across the river, the Town Council repaired the Church in 1561 "frae steeple to the west end". A barrier wall was built and the enclosed nave served as the parish church for over 400 years. Many improvements were made in that time, notably the heightening of the galleries by some six feet in 1811. The outline of the original arches is easily seen. The rib vaulting of the aisles was replaced by plaster. By 1892, further radical changes had taken place during the ministry of the Rev Robert Nimmo Smith, who dreamed of a beautiful sanctuary and restored transepts. The floor was lowered and red pine blocks laid. Plaster was removed from the walls, and two new galleries, east and west, built. A new organ was installed in the East Gallery. Pulpit, font and lectern, and communion table, as well as several stained glass windows were gifted. Only the mullions of the Great East Window and of the South Window were restored, leaving the choir and transepts open to the skies. During the 1920s a concrete raft was sunk in the choir: this undoubtedly preserved the pillars from further subsidence and indirectly laid the foundation for future restoration. This last and greatest restoration took place in the early 1970s. It came about as the culmination of co­operation between the Kirk Session and the newly-formed Lamp of Lothian Collegiate Trust, whose intention to build a centre for renewal in Haddington found early expression in the conversion of the Poldrate Mill and cottages into youth and community purpose buildings. The restoration of the Church was the largest challenge. People rose to it locally and much further afield. Miss Hilda Nimmo Smith gave a generous benefaction, the Kirk Session sold four silver Communion Cups made in the reign of Charles I and no longer in use, and Her Grace, the Duchess of Hamilton initiated an Appeal for funds to restore St Mary's and for the upkeep of the neighbouring Lamp of Lothian buildings – all for community healing and renewal through the Arts and creative activity. Through her untiring efforts, the success of the Appeal was assured. A most timely and economic benefit in the re-ceiling of the tower, choir and transepts was the skilful introduction of fibreglass – lightweight and durable. New flagstones were laid. A central dais was gifted by the Kirk Session and carpeted by The Friends of St Mary's. A temporary organ was also gifted. The building is not only an inspiring place of worship for its congregation, but one of the riches of the Lothians which people, of all denominations and none, regard as a communal asset and one with which they have a legitimate concern. 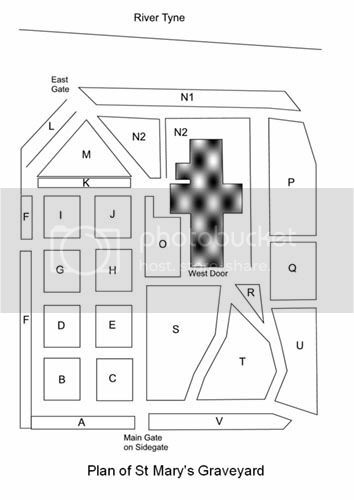 The church contains the early 16th century Lauderdale Aisle, the chapel of the Maitland family, set aside and protected by trust deed for ecumenical worship by the mainstream churches. St. Mary's is the venue for an annual inter-denominational pilgrimage for healing and peace which includes a mass among the day's services. Inaugurated in May 1990, the Lammermuir Pipe Organ built in nearby Oldhamstocks, is of traditional design. It is housed in the North Gallery. 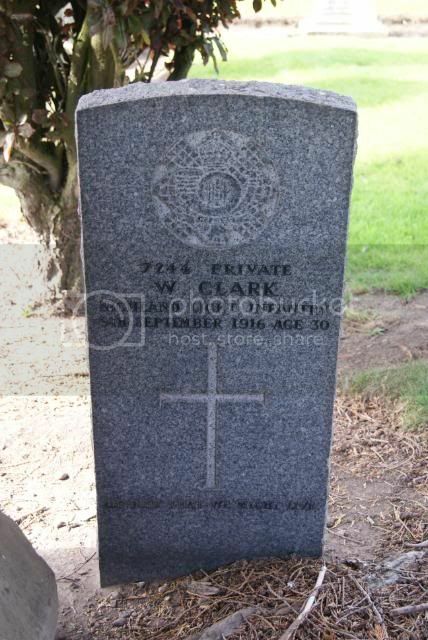 Additional information: Son of Mr. and Mrs. D. Clark. Born at Paisley. 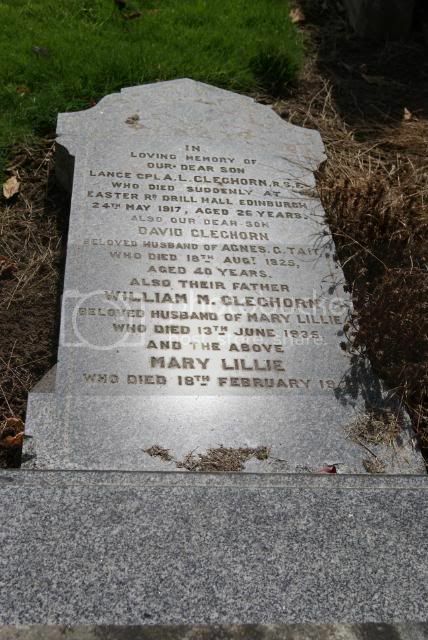 "He died that we might live"
In loving memory of our dear son Lance Corporal A L Cleghorn R.S.F who died suddenly at Easter Rd Drill Hall Edinburgh 24th May 1917 aged 26 also our dear son David Cleghorn beloved husband of Agnes C Tait who died 18th August 1925 aged 40 also their father William M Cleghorn beloved husband of Mary Lillie who died 13th June 1935 and the above Mary Lillie who died 18th February 1940. Sacred to the memory of Jane Webster beloved wife of David Cowan, Beanston Gardens died 14th January 1918 aged 65, David their second son died 5th November 1915 aged 28, Margaret Webster their youngest daughter died 11th February 1921 aged 27, the above David Cowan died 3rd July 1933 aged 86, Margaret Paxton Oliver wife of James Cowan died 20th July 1941 and the above James Cowan died 18th October 1947 aged 63. Additional information: Husband of Annie Wallace (formerly Cranston), of 9, Court St., Haddington. 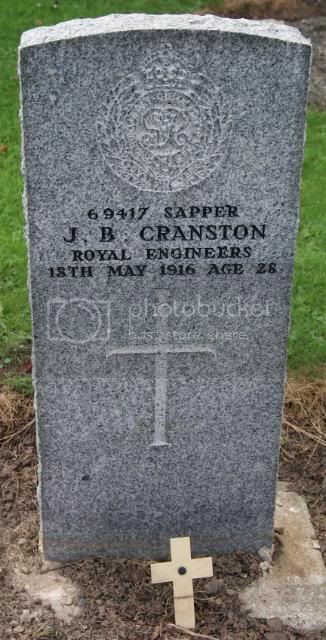 69417 Sapper J B Cranston Royal Engineers 18th May 1916 aged 28. 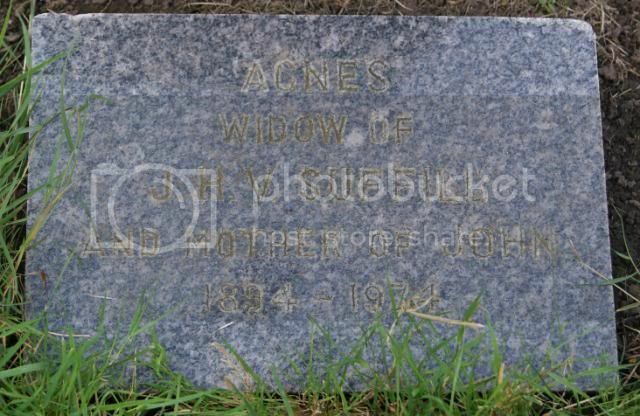 Most families were effected by the Great War, but this family was nearly destroyed. 7 out of Alexander and Elizabeth Cranston's 9 sons fought in the Great War, yet only one of the soldiers avoided death or terrible injury during the conflict. CSM John Cranston (34) Queens Own Cameron Highlanders was killed by shellfire during the first Battle of the Somme. Andrew and Angus were not in the Great War. They also had two daughters, Agnes and Mary. 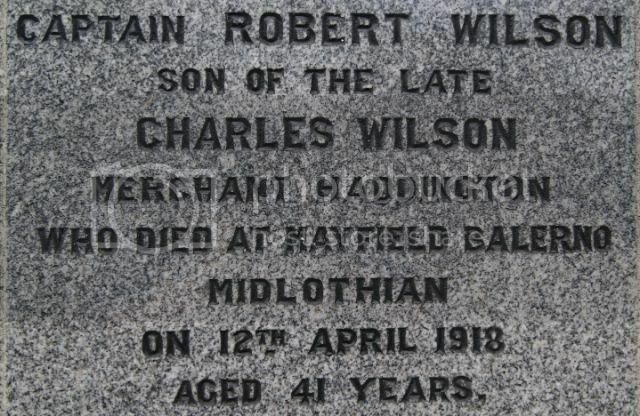 Additional information: Son of Elizabeth Goodall, of Meadow Park, Haddington, and the late Robert Goodall. Additional information: Son of William and Mary Ann Pitcher. Husband of Mary A Pitcher, of Haddington. 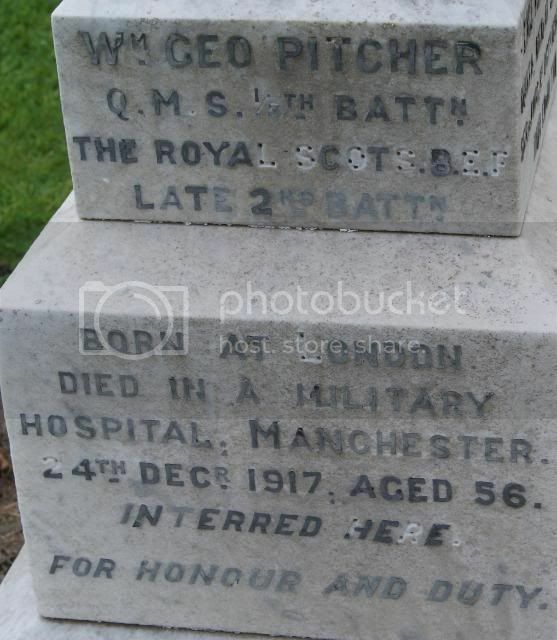 William George Pitcher QMS 1/8th Battn The Royal Scots B.E.F late 2nd Battn born at London died in a Military Hospital Manchester 24th December 1917 aged 56. 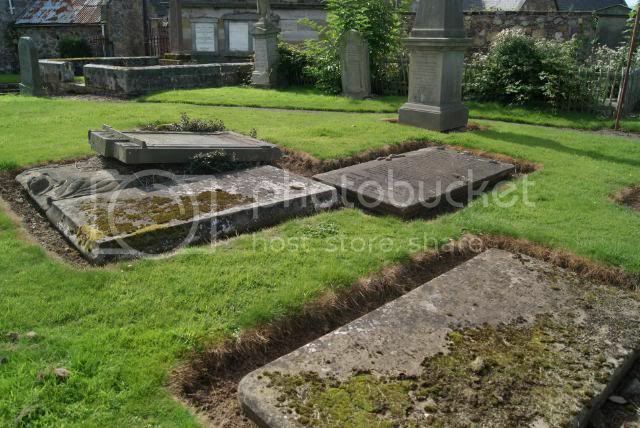 Interred here. "For Honour and Duty"
Sacred to the memory of Alice Melita Pitcher born at Malta died at sea onboard HMS Seraphis 1st October 1892 aged 6 months, buried in the Red Sea. 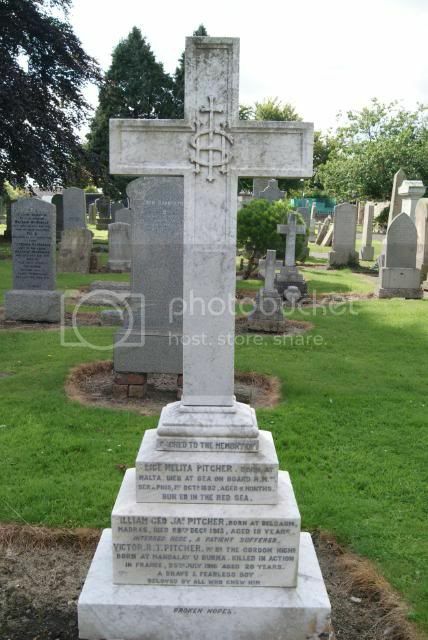 William George Jas Pitcher born at Belgaum Madras died 28th December 1913 aged 19 Interred here. "A patient sufferer". Victor R T Pitcher 1st Bn The Gordon Highlanders born at Mandalay U Burma killed in action in France 25th July 1916 aged 20. "A brave and fearless boy beloved by all who knew him"
Additional information: Son of Q.M.S. William George Pitcher and Mary Ann Pitcher, of Haddington. 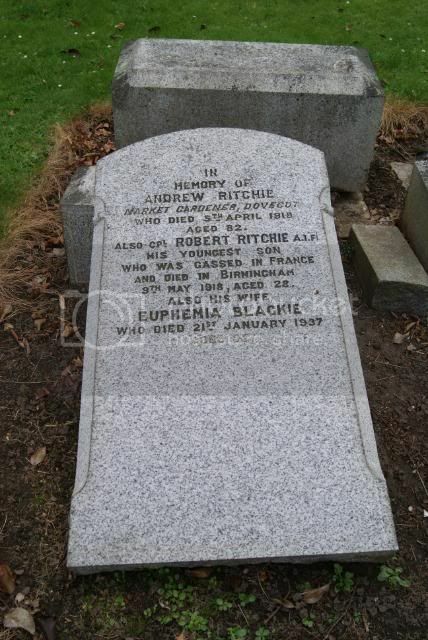 In memory of Andrew Ritchie, market gardner, Dovecot who died 5th April 1918 aged 82 also Cpl Robert Ritchie AIF his younger son who was gassed in France and died at Birmingham 9th April 1918 aged 28 also his wife Euphemia Blackie who died 21st January 1937 aged 82. 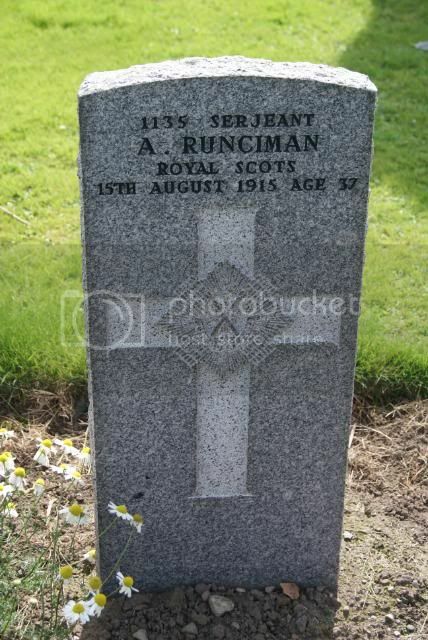 Additional information: Son of Alexander and Helen Runciman; husband of Margaret Runciman, of Peghdelone, Haddington. Born at Haddington. Awarded Territorial Force Efficiency Medal. There is also a family stone. 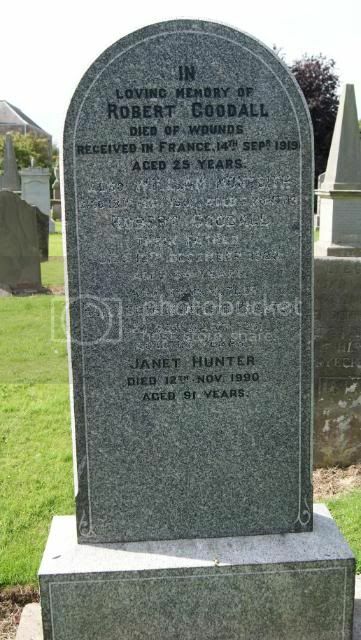 also his son John, Lieutenant 7th V.B Royal Scots died 17th June 1924 and B.E.F France 1914 also his wife Helen Hogg who died 29th November 1927 aged 82 also his daughter Jemima who died 15th January 1933 and his daughter Isabella who died 12th February 1969. 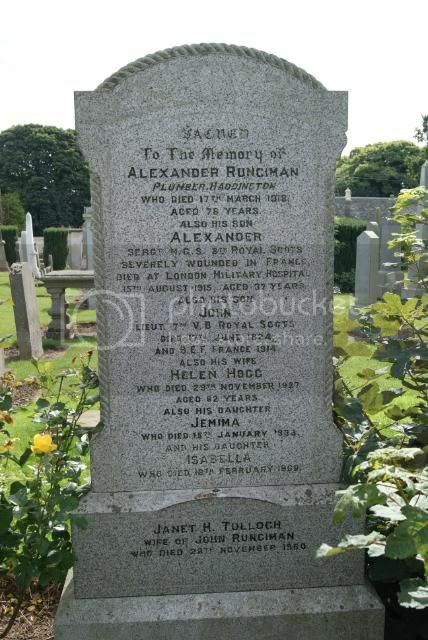 Janet H Tulloch wife of John Runciman who died 28th November 1960. 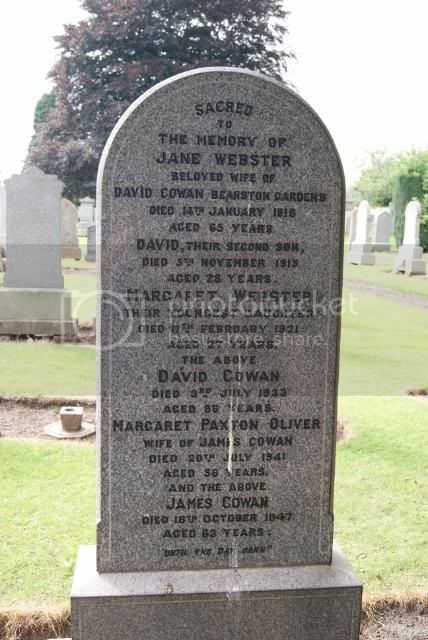 CWGC stone found at M95, family stone at S27. 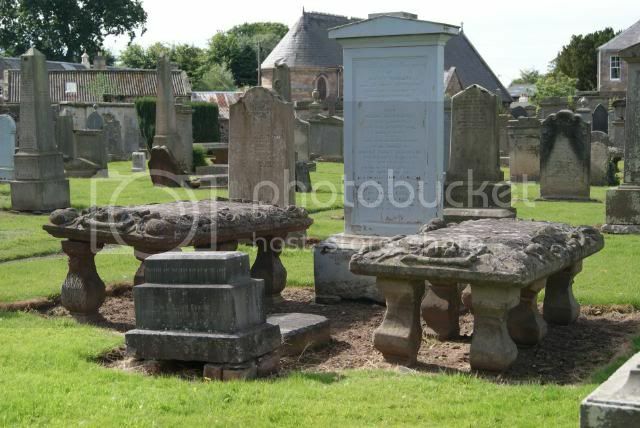 Additional information: Son of George and Grace Scott, of 2, Sidegate, Haddington. In remembrance of George Scott who died 15th December 1879 aged 66 also his sons John Scott who died 27th March 1873 aged 14 and Archibald Scott who died 4th May 1873 aged 16, Christina Laing Scott his grandaughter who died 21st December 1887 aged 3 years and 9 months also Margaret Keltie his wife who died 21st July 1890 aged 58, Margaret Lipscome his grandaughter who died 30th August 1911 aged 24, William Wilson Scott his grandson who died 12th July 1915 aged 23, George Scott his son who died 26th December 1915 aged 65, James his grandson Private 1/8th Royal Scots died at Netley Hospital Southampton 27th August 1916 of wounds received in France aged 20. Marion Grace Watson wife of George Scot who died 25th July 1938 aged 77 also Isabella their daughter 1890-1973. Erected by his family. Unit Text: "D" Bty. 100th Bde. Additional information: Son of Mr. and Mrs. Suffill; husband of Agnes Fairley Suffill, of "Williamville," Sidegate, Haddington. 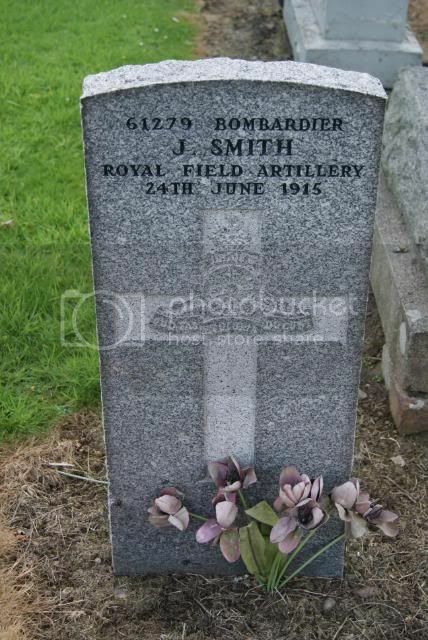 Born at Biggar, Lanarkshire. 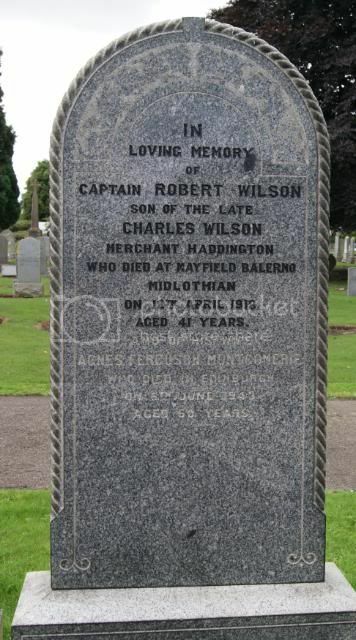 Additional information: Husband of Agnes Ferguson Wilson, of 35, East Claremont St., Edinburgh. Some views of St Mary's Parish Church and Churchyard.